This is a staple at most of my shindigs. You can make it a day ahead and it is such a beautiful presentation. 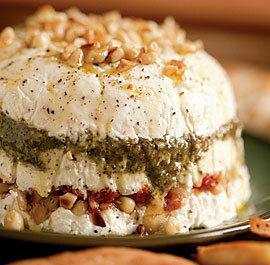 If you aren’t a fan of goat cheese then just use cream cheese. When processing the sun-dried tomatoes it is much easier to cut them up before adding to the food processor. Serve with crostini and crackers. Bring cream cheese and goat cheese to room temperature. With a mixer beat the cheeses and milk until smooth and spreadable. Add more milk if needed to loosen the mixture. Add lemon zest, 1 glove minced garlic and season with 1/4 tsp. salt and a few grinds of pepper. Mix well and set aside. Line the inside of a 3-cup sharply sloping bowl with plastic; let the ends extend over the sides a few inches. Spoon about one-third of the cheese into the lined bowl and pack it into an even layer. Spread the pesto almost completely to the sides of the first layer of cheese. Top with another third of the cheese, the sun-dried tomatoes, and all but 1/2 Tbs. of the pine nuts. Top with the remaining cheese. Pack down, fold the plastic over, and refrigerate for at least 30 minutes. Half an hour before serving, take the bowl out of the refrigerator. Pull on the edges of the plastic to loosen the terrine from the bowl. Invert the terrine onto a plate, drizzle with a little olive oil, and let sit for 1/2 hour to warm up. Sprinkle with the remaining pine nuts, season liberally with pepper, and serve.